Hostelworld users have voted City Backpackers the best hostel in Sweden every year since 2010, and it's not hard to see why. They offer tons of little extras, such as free pasta, free ice skate rental in the winter and a free evening sauna 365 days of the year and they have movie nights. There's also heated floors in the showers, free use of computers and security codes on all doors. Hostelworld guests have praised the attentive staff and their weekly specials, including their traditional Swedish meatball dinners and in the winter their unique Viking Sauna tour. We like their 'no shoes' policy! We're the №1 choice for travelers visiting Stockholm - voted the best hostel in Sweden 2019 by Hostelworld guests. We've got free high-speed internet on our computers (Mac and PC) and free WIFI in all guestrooms. There's free pasta to cook (make your own sauce) and free evening sauna times (the ultimate Scandinavian experience). We have bike rental up to 8 hours. We also have free ice skates and saucer sleighs to burrow in the winter time! City Backpackers is the base camp for the Stockholm explorer. If you like meeting new people, you'll have the time of your life here. The location is the best possible in the city centre - safe and quiet, although only a 500 metre walk from the central railway station and bus terminal. Most of the city's sights, including the Medieval area Gamla Stan (Old Town) can be found within walking distance, and the main shopping street, Drottninggatan, is just around the corner. You can stay in a single or twin room, or a dorm with three, four, five, six, eight, eleven or 12 beds. Female dorms are provided. We also have three apartments/studios for up to eight people with private bathroom, shower and kitchen. Please note that you must be at least 18 years old to stay in our dormitory rooms. City Backpackers is designed to be a great meeting place, where you are guaranteed to meet travelers from all over the world. We have several common areas where you can hang out with fellow travelers: a large, fully-equipped guest kitchen, a courtyard, a cosy breakfast café and a restaurant and bar called 'Nomad'. Our staff takes turns showing Stockholm to our guests. All year we arrange tours and adventures, such as guided bike rides and Kayak tours in the summer and our awesome Viking Sauna Tour in winter. When you want to relax there's a hot sauna and lounge areas with satellite TV, daily newspapers and a book exchange available. There's also a nice courtyard with comfy sofas at your disposal. Smoking is allowed in parts of the yard, but nowhere else. City Backpackers has an environmentally friendly approach. We practice waste recycling, use electricity from renewable sources, use energy efficient white ware and light bulbs, and have an overall environmental policy. As passionate travelers we love our planet and want to save it! City Backpackers is open 365 days a year and has no curfew. No hostel membership is needed. We can't wait to see you, welcome to Stockholm! 10/10 - great hostel that was very centrally located with friendly staff. Wi-fi drops fairly frequently but apart from that I had a fabulous stay! The absolute best hostel I have ever stayed at. The facilities are great, staff are amazing and helpful, and the location is perfect. My favourite part was the atmosphere though, the common areas are great and it’s so easy to meet people. Met so many other travellers and had the best time. Also the bar crawl was super super fun! I left way too soon and will definitely be back! Excellent hostel! Truly enjoyed my stay here. We had a fantastic stay at this Hostel! Exceeded expectations. My favorite hostel yet! The hostel had a lovely atmosphere and a wonderful staff. I love the decor, the cleanliness, the common spaces, and just about everything at this hostel and would highly recommend. One issue was that there was construction going on outside of my room during my stay which was a little disturbing. My other complaint is that some of my clothes were taken from my bed one day, but probably not a problem of the hostel as it is of a guest. 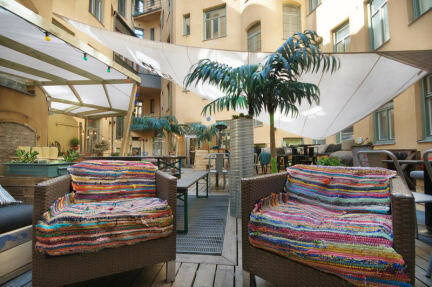 Excellent stay at CB, location was not to far from Central station, main shopping area and Gamla Stan. The staff were extremely friendly and helpful, the room was clean and tea and coffee was available after 11am. Would highly recommend. I think we have the coolest guests! This is the only hostel in Stockholm with young, international travellers as the main target group. Little old ladies from small Swedish towns can be lovely, sure, but if you want to meet backpackers and young independent travellers like yourself, City Backpackers is the best choice. Our kitchen is a great place to meet people, since the pasta is free, and during dinner time everyone hangs out in the kitchen to cook. Every day of the week we organize at least one event to make it easier for our guests to meet and make new friends. Either there\'s a guided tour, picnic or adventure, or there will be a cooking session in the hostel, or game night, or movie night. We also have the free sauna every day, a great place to relax and enjoy the company of like-minded people from all over the world. There's just no other place with an atmosphere like this in Stockholm - it feels like staying in a friend's apartment. Basically, this place is perfect for independent young people travelling alone or in a small group, keen to get to know new people, curious about new places and up for adventure!